In early 2012, just after my son was born, my friend Rogelio got me a gift card to Audible and said “You’ll barely have time to read anymore. You need to get into audiobooks.” It was actually much worse than that. On top of my bedside table still sits a Rolling Stone I started to read four months ago (one more page to go on that global warming article, whew), a poetry book my aunt gave me as a gift (hey, verse is hard), and The Autobiography of Malcolm X (I’m on page 100 or so). I was a slow reader to begin with, but I’ve certainly taken it to the next level. 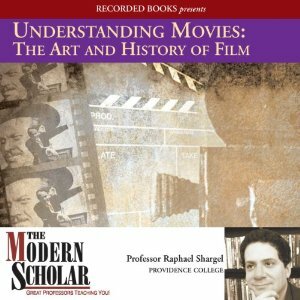 Knowing I was a movie fanatic, Rog also recommended I check out this course on the history of cinema. I’m glad he did. Over fourteen engaging lectures, Understanding Movies: The Art and History of Film covers the art of filmmaking from its inception to the rise of the modern American blockbuster. And even though I knew most of this stuff already, I found Dr. Raphael Shargel’s passion contagious. You can’t help feel elated by the excitement on his voice as he expounds on the virtues of The Godfather (1972) or Do the Right Thing (1989). Better yet, I remembered there was a ton of stuff I hadn’t seen yet, like It’s a Wonderful Life (1946), On the Waterfront (1954), and Nashville (1975). Shame, shame.